Penguins Skate the Cup: C’est Magnifique! It’s a good bet a lot of the revelry Friday night in the Penguins locker room after they clinched the Stanley Cup in Detroit was in French. Friday’s climactic Game 7 had a very French-Canadian flavor to it, with six of the players skating the Cup for the winning team hailing from the province of Quebec — including Max Talbot, who scored both goals in Pittsburgh’s 2-1 victory at Joe Louis Arena, and Marc-Andre Fleury, whose goaltending in Games 6 and 7 was the single-most crucial factor in the Pens successfully overcoming a 3-2 series deficit. In addition to Talbot and Fleury, Kris Letang, Pascal Dupuis, Phillipe Boucher and backup goalie Mathieu Garon were all born in Quebec. 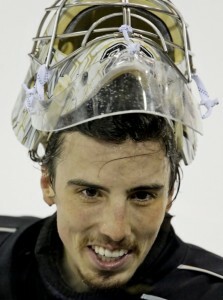 Talbot and Fleury are good friends, and have a pre-game ritual performed in French in which they “talk about their boyhood days, their shared experiences on the Canadian junior teams, [and] their good fortune in getting paid to play hockey on its highest level,” explains Robert Dvorchak of the Pittsburgh Post-Gazette. On the other end of the ice, it was clear early that Fleury was just as engaged in Game 7 as he was in Game 6 in Pittsburgh, and it was going to be really tough for the Red Wings to beat the Sorel native on this night. He was reading plays very well, his positioning was flawless and there was a sense he might just pitch a shutout. Indeed Detroit didn’t get on the scoreboard until only about 6 minutes remained in the contest, on a goal by rookie defenseman Jonathan Ericsson through a screen that Fleury likely never saw. While he may have caught a break when Niklas Kronwall’s blast smacked loudly off the crossbar with about 2 minutes left, he saved his best stop of the evening for last, desperately flinging his body in front of Nicklas Lidstrom’s last-gasp shot from point-blank range with a second remaining. It was a pretty good scoring chance, given the circumstances, and Fleury’s lunging save will be one of the enduring images from the game, along with the scruffy-looking, yet baby-faced Sidney Crosby triumphantly holding the Cup over his head, a coronation not just for Sid the Kid and the Penguins, but seemingly a new generation of NHL superstars. Lemieux hoisting the Cup, then and now. 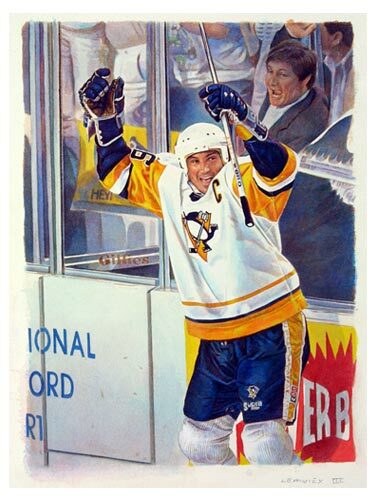 Having said that, while French Canadians can and should continue to take pride in the gracious Montreal native, Lemieux now belongs as much to Pittsburgh as he does to his native province, and probably more so. Is it possible for any person in sports history to endear themselves to a fan base more than Lemieux, who is as much a part of the fabric of Pittsburgh as the steel industry, and the Allegheny, Monongahela and Ohio Rivers? He has now saved the Penguins franchise in Pittsburgh twice over, first vaulting the club from irrelevant, laughable bottom-dwellers to perennial Cup contenders upon his entry into the league in 1984-85. He played his entire spectacular 17-year career with the Pens, then bought the team in 1999 by turning the money owed him by the team in the form of deferred salary into equity in the franchise, saving the Pens from bankruptcy that very nearly led to the team’s extinction in Pittsburgh. They were close to either moving or folding completely, but Lemieux’s plan to pay all the team’s creditors was successful, and now they will play one more season in the NHL’s oldest building, Mellow Arena, affectionately known as “The Igloo,” before moving into a shiny new home beginning with the 2010-11 season, thanks to Mario. And of course, he’s been Crosby’s landlord and surrogate father since Sid joined the Penguins in 2005. Rossi says the Penguins are thinking of placing a statue of Lemieux outside the new Consol Energy Center when it opens, but the humble owner would have to OK that arrangement. Some random thoughts and notes: As mentioned Friday, it had been 30 years since a visiting team in either the Stanley Cup Finals, World Series or NBA Finals won a Game 7 on the road — the 1979 Pittsburgh Pirates. It’s only happened three times in NHL history, the last time coming in 1971, when the Montreal Canadiens bested the Chicago Black Hawks. That series played out the same way as this one did, with the home team winning the first six games before the Habs broke serve in Game 7. • For those that may have forgotten, it was Talbot who scored with 35 seconds left in regulation last year that tied Game 5 and denied Detroit the privilege of celebrating another Cup on home ice, when the Penguins went on to win that contest in three overtimes before bowing out in Game 6. • I enjoy playing fantasy hockey in the winter, and next year I’m making it a priority to target Jordan Staal, who I think grew by leaps and bounds this postseason. I think Letang is another guy who will be undervalued heading into 2009-10. • One of this offseason’s more interesting unrestricted free agents, in my opinion, is stay-at-home defenseman Rob Scuderi. He will surely require a raise from his $725,000 salary of 2008-09. • When commissioner Gary Bettman handed the Cup to the 21-year old Crosby, Sid became the youngest captain in NHL history to hoist sports most treasured trophy, just as he was the youngest player in history to be named an NHL captain before the 2007-08 season. Malkin (22) is the third-youngest player to win the Conn Smythe Trophy.